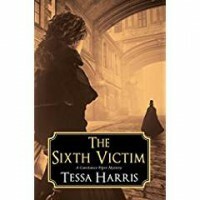 The Sixth Victim (A Constance Piper Mystery) by Tessa Harris is a disturbing book but the brutal events described did carry the story forward. It has a supernatural bent and is brilliantly written. It is a fast, mesmerizing book to read. I gave it five stars because this author made me feel as if I were on the foggy, frightening streets. I received a complimentary Kindle copy from Penguin Random House Publisher Services and NetGalley. That did not change my opinion for this review.